Time Will Tell On Quality Materials. When I tell my customers I’ve got a degree in fine arts they are never surprised. I like to think it’s because of my fantastic use of colors and composition. It’s good to imagine I’m a free spirit living on the goodwill and commission of my fans. Mostly I think it’s because I drive a pretty old truck, I’m a little tight with my money, I have earrings and dress like a grubby hippy when I’m working. Sometimes I come across a job at a house that blurs the line between art and house maintenance. There’s always some machine work. Attention is required or the chances of sanding, sawing or shooting a finger off increase. Then there’s the choice of material application. Lumber, wall board, panelling, trim, stain paint urethane ….you know the finish work. Preparation is important but the application of color and finish become encompassing. I’m a hand application kind of guy. I like to brush and or roll, primer, paint, stain and finish. I’ve got a spray gun, but by the time I sand out a project I’m pretty committed to the hand work approach. About eight and a half years ago I refinished a front entry door on a house. This house was built in about 1930 something and has an arched front door. 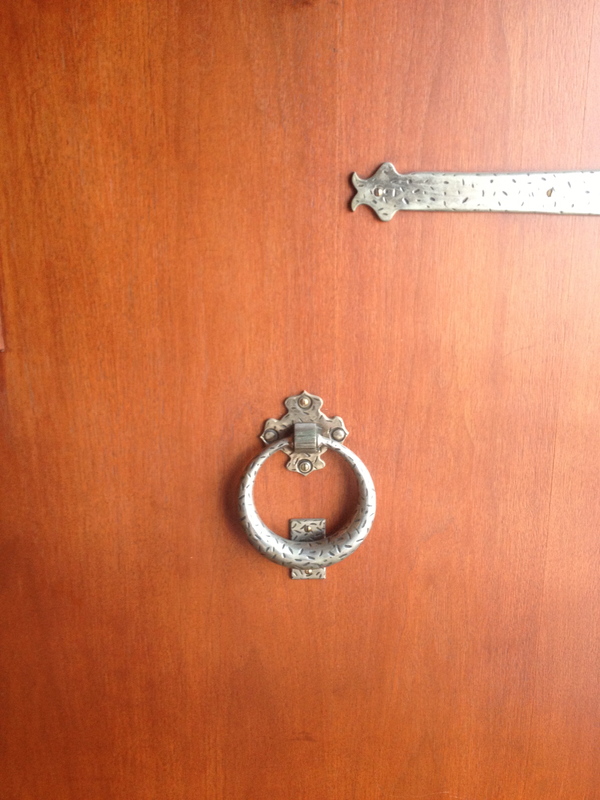 The original lockset and appliqué hinges were there. I polished the lockset and hinges and started to sand out the front door. It was forgiving. Good finish had been used over the years and it sanded out nicely with no gumming up. I used my favorite stain, Old Masters. I’m not an old master myself but I was hoping for good results and a happy customer. First dip in the can and the stain reminds me of the oil paints I used in college art class. The color is beautiful and flows almost on it’s own. It merged with 80 year old wood flawlessly and had the substance to blend with some old blemishes. It hung nicely and stayed soft enough to rub out with a cloth the next morning. Then two coats of oil base urethane with a light sand between coats. Reinstalled the lock sets and decorative hinges. I collected from my customer after gaining her approval and went on my way. I’ve driven past that door a hundred times since then. I’ve looked at the door and laughed at how many times it must have been refinished in the last eight years to keep it looking so nice. I’ve hoped the woman living there who has become a widow since I refinished the door is well. I’ve remembered the joy of the craft that day with such wonderful materials. Last month she hired me again. A ceiling repair in the upstairs hall where a whole house fan used to be. When I visited her to set the appointment I was pleasantly surprised to find the front door just as beautiful to the touch as it was from the road. And, it had never been touched. For eight years the door stood. No re-coating, no wax or polish. Guests had come and gone, a loved one buried and the years continued on. The door stood in quiet beauty shedding cold and heat and the outdoors. It took hard work to get those materials on that door eight years ago. Faster, less expensive materials could have been substituted. But not that much cheaper, and fast does not always mean careful. I worked there for three days last month. I passed that door fifty times doing the ceiling repair up stairs. I left the house wondering how many years that door will go on again with out me.